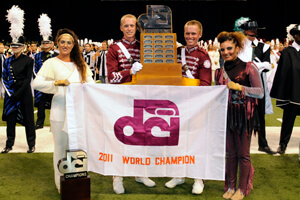 For the tenth time in the organization's history, the Cadets can again call themselves World Champions. 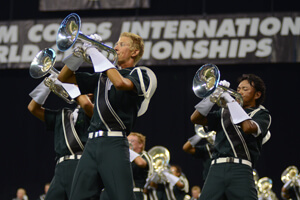 The corps proved that "Between Angels and Demons" lies a corps with unparalleled talent and dedication, earning a score of 98.35 and the 2011 World Championship title on Saturday, Aug. 13, at the Drum Corps International Finals. "It was the best performance I've ever seen in Finals, by far, in 29 years," said Cadets director George Hopkins. "If you can get the audience to stand up for two minutes at the end, I don't know what else you can do." "It was so electric in here when the corps members were performing," said Cadets brass caption supervisor Gino Cipriani. "I've never seen them feel the way they felt when they came off the field. They worked so hard and they deserve everything they have; I was very happy for them." The 77-year old corps also earned two caption awards, which are determined by averaging the scores in each area from the Prelims, Semifinals, and Finals; the Donald Angelica Best General Effect Award and the Best Visual Performance Award went to the Cadets, reflecting the stunning visuals the corps created by clothing half the corps in maroon uniforms—the "demons"—and half in cream uniforms—the "angels." Just before taking the field for the corps' encore performance Saturday night, color guard member Elizabeth Blackford described the feeling of being a champion as incredible; "it is the most amazing feeling in the entire world. I am so happy to be here. A lot of hard work just paid off," she said. The two-time defending World Champions Blue Devils fell just shy of taking home the Champions trophy for a third time with a score of 97.80. Though they are one of the winningest corps in DCI history with 14 titles to their credit, 2011 marked the fourth time the corps has fallen short of a three-peat, also occurring in 1978, 1981 and 1998. Devils' director David Gibbs explained that he has been telling his corps members that they have been his heroes all season long. "There is a lot of risk to join the Blue Devils after going undefeated for two years and after winning two World Championships. They took the risk; they met the challenges. They started the season a little rough, at the end they were one of the most awesome Blue Devils drum corps ever. They're my heroes." Blue Devils euphonium section leader Zak Stillwell said that "there was something in the air from bus to field" that made the day so special. "I'm so proud of this corps," he continued. "We were counted out early, so just to be in contention has been great. It's been an unforgettable year." The corps' color guard impressed during its "The Beat My Heart Skipped" program, taking home the George Zingali Best Color Guard Award. The Cavaliers ended the season in third place, earning a score of 96.90. The corps also took home the Fred Sanford Best Percussion Performance Award, a prize they last earned eleven years ago in 2000. "The show was the best of the season, and there was no better time for us to peak as a group," Cavaliers front ensemble section leader Anthony Jackson said, adding that he can't help but smile when the crowd cheers for their performance. "This has been a very special year because the group of guys I worked with never had a rough spot, all season long. Just being able to perform for 11 minutes one last time with these guys was something special." Fourth place went to Carolina Crown. The "Rach Stars" earned a 95.30 along with the Jim Ott Best Brass Performance Award with their blend of sensational music, old and new. "The audience got up on their feet more than once — when we took the field, about halfway through, and then at the end all three levels just stood up," said euphonium player Jonathan Morgan. After six years with Crown, Morgan is aging out. "My goal was to have a performance to remember for the rest of my life because it's the last one I get to do. This was my last shot and I gave it everything I had." After ending the show with dagger raised the entire season, Phantom Regiment's Juliet character finally took her life on the podium in the final moments of the corps' 2011 show, "Juliet." The corps took fifth place with a 95.05—a score more than a point above its score from Friday's Semifinals competition and the highest score increase of any corps. "The young men and women who marched this show took all their love of each other and for the program and told the audience all about it — sold it to the audience," said Dan Richardson, Regiment's program adviser. "I cried through the whole show. It was a completely emotionally-draining show taking the audience to another time and place. And at the end of the show, the performers were rewarded by a huge audience response." One of the best moments of the evening, front ensemble member Taylor Brinneman said, was "when the crowd stood up at the end of the opener. That's never happened before. " 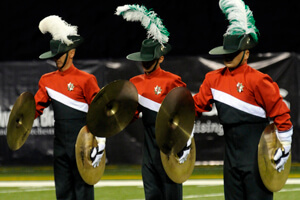 Santa Clara Vanguard ended its 2011 season with a sixth place finish. They demonstrated remarkable consistency, earning the same score at both the Semifinals and Finals competitions—92.20. "They were phenomenal and played from the heart," remarked Tour Director JW Koester. "Putting power and emotion behind it, like Santa Clara knows how to do, they were Santa Clara tonight." A score of 92.05 landed the Bluecoats a seventh place finish. 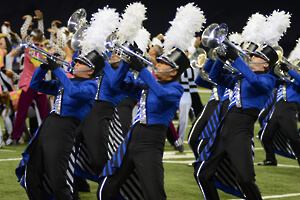 According to Bluecoats director David Glasgow, emotion made the corps' Finals performance better than any other of the season. "The emotion that's run through the hearts of our members these last couple days has been amazing. The emotions are what they are going to remember their entire lives," he said. "Tonight they were able to share that emotion and that love they have for each other, for the Bluecoats, with the audience, and the audience responded. It was just a wonderfully emotional performance." The Boston Crusaders' show, "Revolution," featuring music from "Les Miserables" and the "1812 Overture," took the corps to eighth place with a 90.65. "Our performance tonight was amazing. There was so much energy and everyone just came together as a group. It was absolutely the most unbelievable feeling in the world," said Camaryn Speranza, a Crusaders guard member. "There were just so many incredible shows and incredible people and things that I experienced this summer that it is simply irreplaceable" Boston Crusaders' director Tom Spataro — who won the Dr. Bernard Baggs Leadership Award, as the World Class director of the year — explained that the last show of the season is always special. "We've come an incredibly long way this year and the corps took it to another level tonight. They did something I haven't seen all season and what a night to do it." Ninth place went to the Blue Knights, who earned a score of 89.20 with their program, "An English Folk Song Suite." Executive Director Mark Arnold said 2011 was a significant year for the Blue Knights; "We've had a beautiful show put together for us this year. The music was incredible, and it was something that we knew the crowd, our fans would really love," he said. "This is kind of a watershed year in where the Blue Knights started making their fans love them, and it was something that we've been aiming for with the changes we've made. This corps has grown together and they are still very young, and they're all excited to keep this going." Ending in 10th place, the Madison Scouts earned a score of 87.55 with their show, "New York Morning." As baritone-playing, age-out member Corey Jahlas explained, the season was about so much more than the results of the competition. "We've seen people crying in the audience and people have come up to us and said, "I was there [in New York on Sept. 11]. Thank you." That means more than any placement or points. It was really cool just to have that connection with people and be able to give that to them," he said. Jahlas said of his last show, "You have this moment where you realize that 'this is the last time I'm ever going to do this and play these notes and be with these people." You realize you need to put it all out there and make it the best you can, and that's what we did tonight. It was amazing and wonderful and fun." 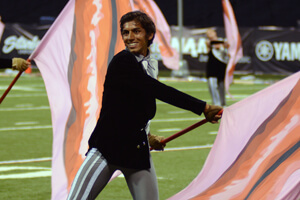 Eleventh place went to Blue Stars, which earned an 86.20. Kekoa Mateo, a third-year color guard member, explained the variety of emotions corps members feel on the last day of the season. "There were a lot of different feelings coming into our performance tonight — the emotion of having to leave everybody you've been with all summer after the last performance, and the overwhelming feeling of how big the stadium is and how packed the stands were was really awesome," he said. "The Blue Stars is all about family. These were some of the most incredibly talented and friendly people I've ever marched with." In the first year after reclaiming their traditional name, Spirit of Atlanta achieved a 12th place finish in the 40th DCI World Championship Finals competition. "It seems like it's been an eternity [since we were last in the World Championship Finals]. Of course it's only been since 2007, but those years have been a very long time for us. We're very happy to be back," said Joel Vincent, Spirit's executive director. "This [season was] beyond belief, it was more than we hoped for but everything we had planned for ... We have been very fortunate this summer for that dream to come true." Caitlin Boline, a third year cymbal player said the performance was the most amazing experience of her life. "Ever since I started marching, my dream was just to be there Saturday night and perform in front of the [Finals] crowd, and I made it. This corps made it, and we're back," she said. 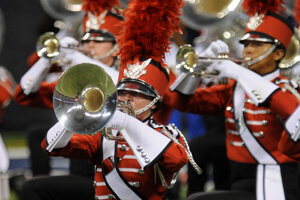 After one of the most competitive Drum Corps International seasons to date, fans, corps members, instructors, directors and more are left wondering what the corps will do next year to top it. 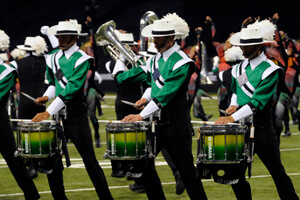 But all will need to wait until Drum Corps International kicks off its 40th Anniversary season in 2012 to see if that's even possible. And it is without question that fans will want to return — or come for the first time — to Lucas Oil Stadium Aug. 9-11 in Indianapolis to see how it all plays out. View a complete recap of scores from this event. Contributing to this report: Michael Boo, Ryan Cain, Johnny Gilbert, Jeff Hartowicz, Jeff Langan, Christina Mavroudis, Linda & Sid Unser, Chris Weber, Kate Weber.